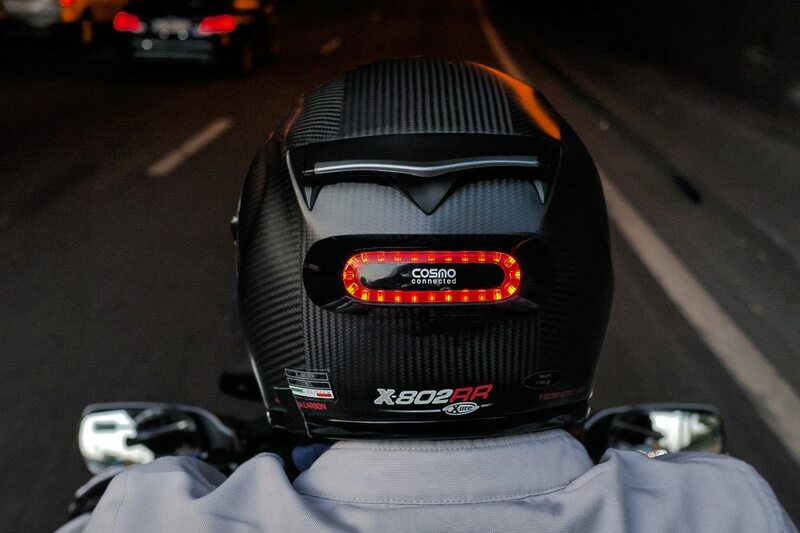 This month’s Product of the Month is a brand new device that will dramatically increase the visibility of motorcyclists from behind; most particularly in a decelerating scenario when the light, which attaches to the back of the helmet, operates like a brake light. 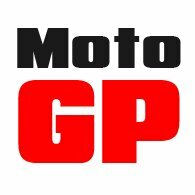 Motorcyclists are still, statistically, the most at risk group of road users. More than half of road traffic accidents involving motorcyclists are down to the negligence of car drivers whose usual refrain is: "I didn’t see him”. Many studies have shown how and why this happens, but the reality is that it puts the onus on motorcyclists to ride and dress in a manner that makes it difficult for car drivers to ignore them. One of the issues in rear-end accidents is the low level of the brake lights on most bikes. In a modern car, particularly a large SUV or 4x4, the natural line of sight is much higher than a bike’s rear light. This becomes even more of a problem if we’re talking about a large van or a lorry. It was Volvo research that proved how safety improved when a brake light was mounted at a higher level on a vehicle. In essence, the Cosmo brake light applies this thinking to a motorcycle. The device fixes on to the rear of a helmet. It uses a magnet to affix itself to a stick-on pad that adheres to the helmet. In the event of an accident the light will detach in any kind of glancing blow, although the magnets are strong enough to ensure that the light will never come away in normal riding conditions. The beauty of the system is that you can buy additional stick-on pads so that you can use the same light on a number of different helmets. 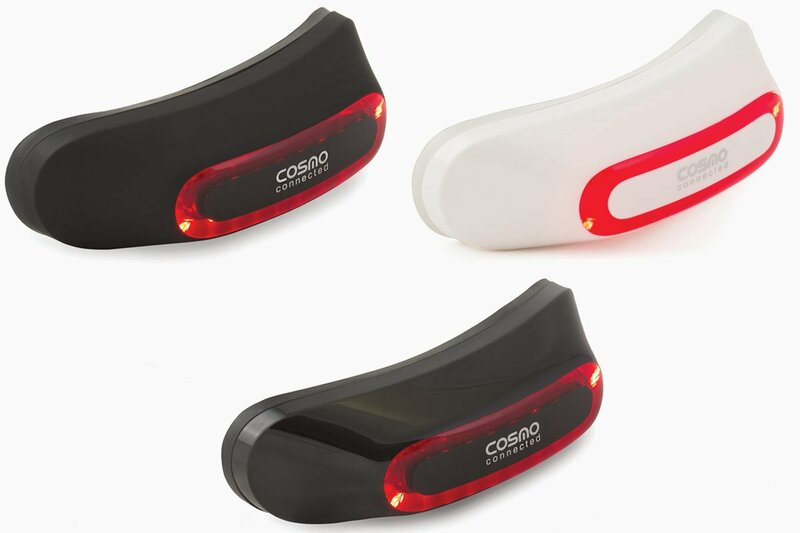 The lighting element in the Cosmo light is powered by a 900 watt lithium-ion rechargeable battery that delivers between five and eight hours of continuous use. On standby mode, the battery will hold its charge for between five and seven days. The light charges by means of a micro-USB cable. Cosmo tell us that the operating temperature ranges from -20° to 65°. That should be sufficient for pretty much everybody. The light itself comprises 24 LED lights. The lights can be set for different configurations. The light can be set to be off, and then only to come on when the bike decelerates. But you can also set the light to be on permanently on a low-intensity setting, rather like a running light. Only when you decelerate will the light crank up to the high intensity setting. You can also set the light to flash as a warning mode. In the event of an accident when the helmet hits the ground, the Cosmo will detect an extreme situation, and will blink repeatedly, warning drivers and riders behind you of the situation. This is potentially a life saver at night, obviously. It is an ‘accelerometer’ in the helmet that detects the change in speeds, and which therefore triggers the brake light function. It is not connected to the use of the brake however, so the light will come on under heavy engine braking also, a scenario in which the bike’s own brake light will not be activated at all. The Cosmo also conceals a gyrometer, which is how the device can detect a fall. The device is designed to be connected to a smartphone via Bluetooth, and it is this connectivity that will trigger a text message to up to three numbers in the event of a fall. A subscription service can be taken up that will actually alert the emergency services in the event of an accident. 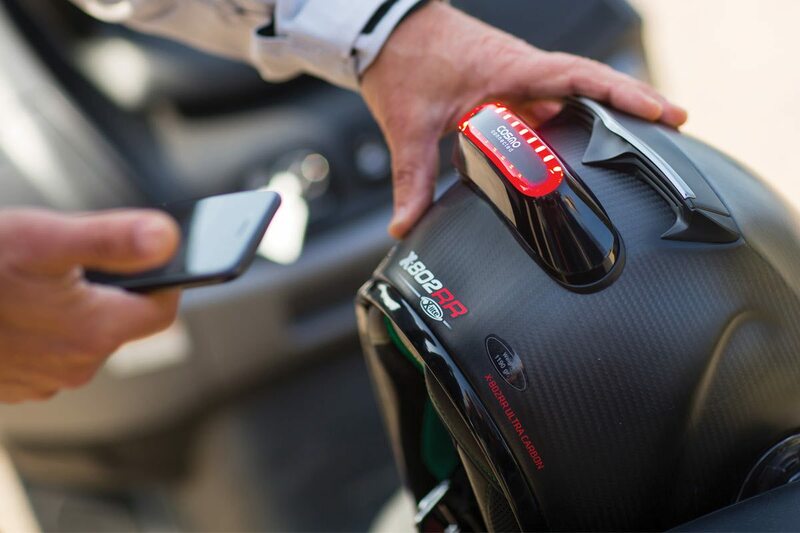 The emergency services will try and call the rider, but if the rider is unresponsive, in the event of a serious accident, first responders will be given the Cosmo’s GPS co-ordinates, along with the medical profile of the rider. We’ve tested the Cosmo on helmets here at Motolegends. And it works. In fact, cost and aesthetics aside, it’s difficult to make for not wearing a Cosmo brake light. In traffic and in low light condition, it’s got to give you that extra margin. We think the way it goes onto the helmet has been well thought through. The magnets are strong, but it’s clear that it won’t take much of blow to dislodge it. And the adhesive pads mean that one device can go on a number of helmets. The lights come in white, gloss black or matt black. They’re on the shelf, and cost just £129.99. And that doesn’t seem to be a huge cost given the fact that it could save your life.